family law courts. My 40-year career as a family law attorney includes more than 25 years of experience as a temporary judge, special master/referee and mediator in divorce cases in Orange County and Los Angeles County, I understand how emotions can often take control of the settlement process, and I am expert in helping clients be effective in mediation despite their emotions. People often come to a divorce negotiation with preset ideas of what they should expect from the other party. It is often said that lawyers are the only ones who benefit when an emotional dispute over property, support, or visitation rights turns ugly. The truth is, in an adversarial environment, it is too easy to let a minor argument get out of control and turn into costly litigation. It doesn't have to be that way. With divorce mediation, you stay in control of the outcome. It is important to understand that the courts seek justice, not winners and losers. Judges are obligated to protect the financial interests and legal rights of both parties, and they take their responsibilities seriously. As an experienced professional mediator, I make sure both parties understand how judges, lawyers and other clients think, how the courts work, and what has worked for clients over the years. Then through the mediation process, I focus on helping clients explore the available alternatives as they seek a common-sense, fair solution. Often, simply discussing the facts in the light of the legal background helps clients understand the legal, financial, and family realities. Clients should not come to mediation seeking "the big win." but rather that their divorce agreement will be fundamentally fair and one that each client can live with. I can say with confidence that you cannot find a professional divorce mediator who comes to the table with more knowledge, skill, experience and respect for the process. My clients include individuals of all financial means, with complexity which stretches from the very simple to the most complex. I work hard to learn what is important to each client, then with the insight gained from my many years of litigation and mediation background, I am able to create an understanding of the various alternatives available and assist with the negotiations by encouraging the clients to choose the alternatives and compromises which fit their needs. We focus our attention on the important issues and avoid the expression of the high emotions which can hinder our progress. By expecting that each party will be treated with respect and dignity we can make sustained progress towards an agreement. In addition to mediation services, I also offer experienced representation and sound legal counsel in other areas of California family law, including prenuptial/postnuptial agreements and legal representation in divorce negotiations. I am approachable, personable, and responsive to your needs and concerns throughout your legal matter. If you are heading into mediation, arbitration or litigation to resolve your property or custody matter, it is important to have experienced legal counsel to protect your financial and legal interests. You can rely on my extensive experience to help you through the process. 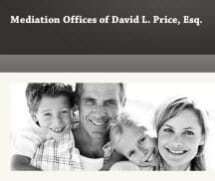 From my office in Orange, I provide California divorce mediation and family law negotiation services for clients throughout Orange County and Los Angeles County. Contact my office to arrange an initial 30- to 45-minute free consultation about mediation services, my fee schedule and other areas of my California family law practice. *AV Preeminent and BV Distinguished are certification marks of Reed Elsevier Properties Inc.,used in accordance with the Martindale-Hubbell certification procedures, standards and policies. Martindale-Hubbell is the facilitator of a peer review rating process. Ratings reflect the confidential opinions of members of the bar and the judiciary. Martindale-Hubbell ratings fall into two categories: legal ability and general ethical standards. 9:00 AM - 5:00 PM M-Th, 9:00 AM - Noon Fri.